Valve has finally made Steam for Mac official, with the platform already primed with a number of downloadable titles. In an announcement, Valve said that Portal will be its first title available on the platform, noting: "The first collection of Mac titles will demonstrate 'Steam Play,' which allows customers to purchase a game once and play it on all Steam supported platforms." "Portal, in addition to supporting Steam Play, will be the first of Valve's Source engine based games available on the Mac. "Native OS/X support for the Source engine is also available immediately to licensees for use in their games." Speaking about the launch of Steam for Mac, Max Schaefer, co-founder of Runic Games, said: "We're very excited to be bringing [the game] Torchlight to the Mac. "Having Steam for the Mac solves so many problems for us as a developer. We look forward to our future games coming out on the Mac as well." 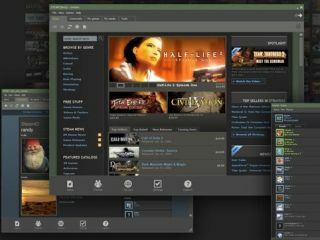 To go alongside the gaming platform, Valve is also introducing its Steamworks suite of publishing and development tools to Mac game devs. "These include product key authentication, copy protection, auto-updating, social networking, matchmaking, anti-cheat technology, and more," states the release. "The features and services available in Steamworks are offered free of charge and may be used for both electronic and tangible versions of games." An update of games is to come each Wednesday for the platform, with "each designed to highlight specific functionalities of Steam on the Mac". In short, Mac users have finally got the games platform their computers sorely need.